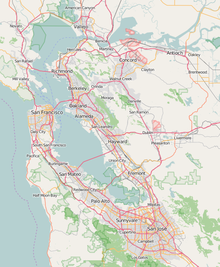 Bair Island is a marsh area in Redwood City, California covering 3,000 acres (1,200 ha), and includes three islands: Inner, Middle and Outer islands. Bair Island is part of the larger Don Edwards San Francisco Bay National Wildlife Refuge. It is surrounded by the Steinberger slough to the northwest and Redwood Creek to the southeast. The California Department of Fish and Wildlife's Bair Island Ecological Reserve consists of 1,985 acres (803 ha) on the Middle and Outer islands, although the entire island group is managed by the Refuge. Bair Island is an important ecological wetland, which provides critical habitat for a variety of species, including the endangered California clapper rail and the Salt marsh harvest mouse, and is an important stop for birds on the Pacific Flyway. Bair Island is bisected by Corkscrew Slough, a major haul-out site for harbor seals (Phoca vitulina). Bair Island is the largest undeveloped island in the San Francisco Bay and was used for farming, grazing and salt production since the 19th century. A residential development called South Shores had been proposed to build a housing estate with 4000 houses on the marshland. It was approved by the Redwood City council, but a citizens referendum narrowly defeated the project in 1982 by just 44 votes. The Peninsula Open Space Trust purchased the property in 1996 and deeded the site to be part of the Don Edwards National Wildlife Refuge, and the Bair Island Ecological Reserve was established in 1997. In 2013, a pedestrian bridge was opened to connect to trails around the island to allow access to the naturally restored wetlands. In 2017, tour guides began leading pedestrians on the trails and showing the effects of wetland restoration. Some species that have flourished since the restoration are the California clapper rail, pickleweed, and pelicans. ^ "Bair Island". Geographic Names Information System. United States Geological Survey. January 19, 1981. Retrieved 2012-12-04. ^ a b "Bair Island Ecological Reserve". California Department of Fish and Wildlife. Retrieved 2016-06-23. ^ "Bair Island". U.S. Fish and Wildlife Service. Retrieved 2016-06-23. ^ Department of the Interior and Related Agencies Appropriations for 1993: Testimony of members of Congress. U.S. Government Printing Office. 1992. p. 104. ISBN 978-0-16-038699-2. ^ a b Bair Island Ecological Refuge Restoration and Management Plan: Environmental Impact Statement. 2006. pp. 3, 35, 256. ^ "Corkscrew Slough". Geographic Names Information System. United States Geological Survey. ^ a b Kay, Jane (March 15, 2007). "NEW LIFE FOR BAY SANCTUARY / Once farmland, salt ponds, Bair Island now protected and ready for restoration". San Francisco Chronicle. Retrieved 2016-06-23. ^ Walker, Richard (October 1, 2009). The country in the city: the greening of the San Francisco Bay Area. University of Washington Press. p. 116. ISBN 978-0-295-98973-0. ^ California Coast & Ocean. State Coastal Conservancy. 1997. p. 168. ^ Eslinger, Bonnie (April 22, 2013). "New Bair Island bridge opens way to almost fully restored wetlands". San Jose Mercury News. Retrieved 2016-11-29. ^ Bonilla, Bethney (March 8, 2017). "Bair Island attracts visitors looking to escape Bay Area development". Peninsula Press. Retrieved 2017-08-24. ^ Schuessler, Anna (June 21, 2017). "Wildlife and residents flock to Bair Island: Island restoration makes 3,000 acres of tidal marsh available". San Mateo Daily Journal. Retrieved 2017-08-24. This page was last edited on 3 April 2019, at 11:31 (UTC).